There are a lot of good boat building books (BBBs) out there, and I own many of them. But when I started to build Cabin Boy, I decided to pick one guru to follow. That guru, for me, is Greg Rössel and specifically his book Building Small Boats . "Consider, however, the matter of understanding. 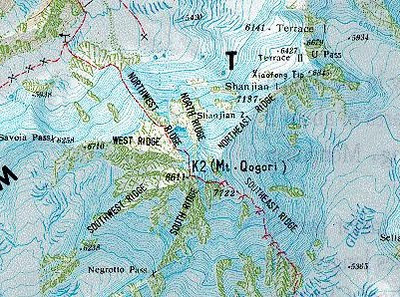 One can intellectually get the idea of what a topographic map means without ever climbing a mountain, but the lines on that map gain enhanced meaning and purpose after you have climbed the mountain." I'm still struggling in the foothills of wooden boat building, but I can finally see the summit, and it looks grand from where I'm standing. Lesson 1: Don't cheap out on your spiling stock. The first thing I did was change my spiling stock from junk 1/4" plywood to 1/8" Luan plywood. As usual, a number of people, including my boat building friend Roger, told me to use Luan, but I cheaped out and tried to use what I had on hand. Big mistake. 1/8" Luan is much more flexible than normal plywood, and that lets it curve around your forms without cracking. Nothing worse than spending a couple hours spiling and cutting out a pattern, only to have it crack in half when you try to bend it around the forms. Plus its cheap... I paid less than $10 a sheet for it at my local lumber yard. Don't be fooled by the fancy name, 'Luan'. That's just the type of wood its made from. It's cheap, readily available, and perfect for the job. I won't use anything else from now on, unless I find something even better. Lesson 2: Don't edge set your spiling batten. At all! The second thing I did was to use a three-part spiling batten. The three parts can be positioned independently on the forms, so they stay between the lines you are trying to spile without any edge setting. Just tack them into place on the forms, and then splice them together with gussets made from small pieces of luan. Lesson 3: Simplify the stem rabbet as much as possible, and then cut it! After spiling the hood end (the part that fits into the stem rabbet) of the garboard the first time, I realized that the rabbet along that short segment of the garboard plank was nearly a straight line. I decided to make life easier for myself and pretend it was a straight line. In other words, I decided to turn that curving stem rabbet into 4 straight line segments, one for each plank. This might not be possible for a stem with a big curve in it, like the round-bottom boat in Greg's book, but Cabin Boy, and most other flat-bottom boats, have very little curve in their stem rabbet. Lesson 4: Don't even try to spile the hood end of the spiling batten. 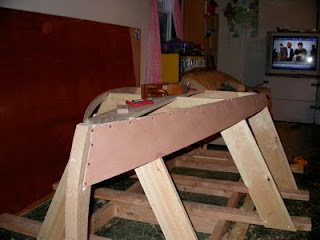 Instead, make a pattern that fits into the stem rabbet, and use that as the forward part of your spiling batten. Since I had eliminated the curve in the stem rabbet, it was easy to cut a pattern that fit into the rabbet. I did this by cutting a piece that was close, and then trimming it until it fit. If you look at Photo 1, above, you will see that the first part of the 3 part spiling batten is actually a pattern that fits snugly into the rabbet, and along the chine log. So, instead of spiling the hood-end of the plank, I would just trace around the pattern. Easy-peasy, and more accurate. After learning and applying these lessons, I was able to accurately spile the garboard plank. With the spiling done right, the rest of the job was easy. First, I unspiled my spiled points on to my pattern stock, which was also luan plywood, using the same techniques described in A Garboard Tragedy. Then I cut out the pattern, this time trying a jig saw, rather than a bandsaw. I reasoned that a jigsaw was basically a hand-held bandsaw (not really, but pretty close), and that it was easier to maneuver the jigsaw around the sheet of plywood, rather than maneuver the plywood through the bandsaw. Now, jigsaws don't get much respect from boat builders or wood workers in general. I'm sure if I ever reach the summit of boat building, I'll probably agree. But down here in the foot hills, I must report that a jigsaw -- fitted with a narrow, fine toothed blade -- did a much better job than the bandsaw. In fact, a 'good enough' job. See Final Lesson below for more on this subject. Once the pattern was cut out, it was time for the big test... Were the lessons I learned correct? Was my spiling job 'good enough'? Would the pattern fit onto the forms without edge setting? Joy, oh, joy... it did. Nearly perfectly. I trimmed the hood end to fit more tightly into the stem rabbet (I had purposefully left a little 'extra' on that end, to allow for fitting), smoothed the long edges a bit with a plane, and I had a perfect fit. No edge setting. Did if feel good? You better believe it! After that, it was just a matter of lying the pattern on the sheet of 1/4" Okoume marine plywood, tracing around the pattern, and cutting it out with the jigsaw. I then bedded it onto the oak stem, chine logs, and transom with a liberal slathering of 3M 101. I will be epoxying the planks together at the laps, but am using this flexible sealant at the stem and transom because I've heard that epoxy doesn't bond all that well with White Oak. There is much controversy over this question, and I don't have enough experience to weigh in on one side or another. The bottom line for me is that using 101 is a safe route. I know it will work. Plus I'll get to compare the 101 bonded joints with the epoxied joints. If I notice any difference, I'll blog about them. Update: after being towed 2000 miles up the east coast of the US, and suffering more abuse in a year than most dinghies get in a decade, neither joint ever leaked a drop. Unfortunately, 3M 101 is no longer available! I then fastened the plank with #8 silicon bronze screws... perhaps 'over fastened' would be a better way to put it. One thing's for sure, that plank isn't going to fall off. I did make one mistake... I should have done one thing before fastening the plank on, but I'll deal with that little whoops next time. Experienced boat builders have already noticed my omission, I'm sure. Final Lesson: Don't aim for perfection on your first build. This is a lesson I have finally learned myself. I have not seen it mentioned in any boat building book -- possibly because they are aimed at people with more wood working experience than me. I'm not sure. But there is a thread of perfectionism in the boat building culture, I think. You know the kind of boats I mean: perfect lines, masterful joinery, paint job by Michalangelo, a varnished sheer strake... the kind of boats that are celebrated on the cover of Wooden Boat magazine and displayed by their proud builders at wooden boat shows. These boats are built by builders who have reached the top of the mountain and are brilliant. But to aim for perfection like that with your first boat is like a first time portrait painter trying to produce a masterpiece on the first go. It just ain't possible! At least, not for me. It helps, I think, for first time builders to accept the fact that we are learners, and to aim not for perfection but for the best we are capable of. This allows one to focus on learning the core skills like lofting and spiling and cutting rabbets. Only after mastering these very difficult skills does it make sense to focus on the finer skills needed to produce a masterpiece. Olde-time boat builders would agree, I think. They spent years as apprentices, learning their craft at the feet of masters, while building many boats. Only amateurs like me, with no wood working experience at all, would start with higher expectations. I don't know if I'll ever reach the summit of the boat building mountain, but I do think the step-by-step method is the way to get there. You can climb any mountain, as long as you climb it slow enough. FABULOUS! Congrats on getting that first plank on. The remainder will be easier now that you've learned so much. As for perfection, I had the very great pleasure of spending a couple of week under Greg Rossel's training. More than once, he said "We're not building a grand piano." I think he was aiming that subtely at the cabinet makers in the class, but the point is well taken. Then again, now that you have solved this one, it's only a very small step to making an accurate hood end. Hold a piece of paper over the stem. Trace the edge of the rabbet with the edge of a pencil tip. Transfer the upper and lower plank lines to the paper. Extend them a few inches. Lay the tracing over your luan and cut out that piece. Glue it on to your spiling plank as yet another piece. Unspile by tracing directly. Perfection! Tracing paper... dang! Why didn't I think of that!